Police in Missouri put out a warning that was both terrifying and bizarre: Armed robbers were believed to be targeting people hunting for Pokemon. You read that right. Pokemon. The little monsters. 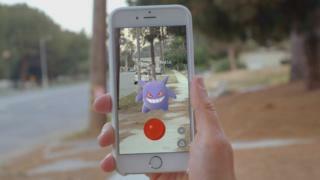 Police said the victims were playing Pokemon Go – a new smartphone app that encourages gamers to search local areas to find Pokemon in the “real world”. Certain locations offer bonuses and higher chances of catching rare species and that’s where officers said criminals had been lying in wait. “It is believed these suspects targeted their victims through the Pokemon Go smartphone application,” the post on the force’s Facebook page read. The incident was just one of several odd goings-on in the first weekend of Pokemon Go’s release – a title that achieved such rapid popularity it had to be briefly shut down while servers were upgraded to handle demand. The app’s innovation is its use of augmented reality (AR). The Pokemon are placed within real-life views captured by the phones’ cameras. When I fired up my app for the first time, a little Charmander was lurking near my TV cabinet. Within moments, I had my shoes on and was out of the door to find more – I needed to get to a nearby Pokestop, a location where you gather supplies. It turns out the fairly inconspicuous corner near my flat is something of a Pokemon hotspot thanks to a little landmark – a mural above eye level – that I hadn’t even noticed before. Great, I thought – that’ll be handy, having a Pokestop so near my house. And then it hit me – I’m 30 next year. The Pokemon franchise has always been huge business, but the game’s prior success may pale in comparison to what’s ahead for the app. So far, its launched in the US, Australia and New Zealand. Europe is up next. Oh, and Japan. I think it’ll go down well there, somehow. Some gamers are using workarounds to avoid the wait – such as signing in with a US iTunes account on a UK phone. Its success isn’t just anecdotal. Pokemon Go has already been installed on a phenomenal 5.16% of all Android smartphones in the US, according to SimilarWeb, an app analytics firm. For context, that’s more installs than dating app Tinder. Almost double, in fact. SimilarWeb estimates that by the end of the week on Android, Pokemon Go will have more active users than Twitter. Twitter! Right now, the average time players are spending on the app is about 43 minutes a day. More than WhatsApp, Instagram, Snapchat and Facebook Messenger. That will presumably dwindle away a little, but wow – what a start. It’s terrific news for Nintendo. The beleaguered Japanese gaming giant has a 33% stake in the Pokemon company and has also created a small wearable accessory that buzzes if the monsters are nearby. Since Pokemon Go’s release, Nintendo’s share price has soared – up by almost 25% in Monday’s trade on the Tokyo Stock Exchange. Until now, the firm had all but snubbed smartphone-gaming. But this title could come to define the activity in the way its Game Boy did for handheld consoles all those years ago. But like every new craze, particularly one that is likely to obsess children, we’re now entering a period where any story with a Pokemon Go angle instantly grabs attention. First up – there are privacy concerns. The app needs lots of permissions – location data, camera and more. Almost overnight, its developer Niantic has found itself in possession of an enormous amount of data about specific people. People are putting pressure on it to clarify what it intends to do with that information. Parents might also feel worried about their kids wandering, zombie-like, into areas of towns they wouldn’t normally go. Furthermore, the in-app purchases are enough to make your eyes pop out: $99.99 (£77.73) gets 14,500 Pokecoins to buy things in-game – you can, of course, purchase smaller amounts. Alongside Missouri’s police warning, we’ve also seen darker scenes in Wyoming, where a Pokemon Go trainer reportedly stumbled across a very real dead body. And authorities in Washington State are urging players not to combine the activity with driving. Though that did give Keith Green, from South Carolina, an idea. “For the low price of $10 per hour,” he offered, “you can have me drive you around on a Pokemon Safari. He told me no-one had taken him up on the offer. Yet.